• Powerful 2000 watt top heater. • Infra-red (IR) bottom heating technology. The heating element provides extremely uniform preheat over the entire surface. The bottom heating panel is 19" x 19" and features four (4) independently programmable heating zones (6000 watts). • Programmable cold air injection and linear air knife provide precise cool down control to optimize time over reflow. • Interactive thermal profiling provides "on-the-fly" adjustments. • Control of X, Y, Z, Theta, Vision Zoom, Vision X & Vision Y. • Automatically indexes the camera to the four corners of large components up to 75mm. • Multi-position pick capability from large and small waffle trays, gel packs, tape and reel, and single component nest. • Precision Micro-Force sensing provides the extremely low force needed to pick tiny, fragile devices. • NEW Micro Tip Site Clean Assembly (#1015.11.059) with a high temp, non-abrasive, composite vacuum micro tip with an inside diameter of 0.063". • Composite vacuum tip with automatic height adjustment, automatically compensates for variable residual solder volume. • Eliminates potential damage to pads or solder mask caused by contact-based methods. • Especially critical for removal of Lead-Free solder with higher reflow temperature and for micro site cleaning of small, fragile pads/solder mask. 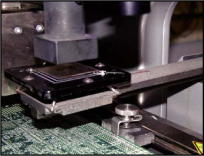 Programmable micro tips remove solder from small sites without affecting adjacent devices. • Powerful heat and vacuum, combined with high efficiency bottom heating, can also remove solder from barrels of through hole and Mictor connectors. • Conductive heating/vacuum tips remove solder from 0201 and other pads where convective site cleaning can not be used. • Graphical user interface provides a visual representation of the board and component locations to the operator. One or multiple component sites can be reworked during a single cycle. 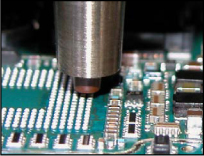 ﻿• Provides process repeatability by insuring that the board is at the exact same target temperature each time before localized reflow begins. • Laser point provides a visual reference to the center of the IR sensor verifying position over the substrate at the same location as profiled. • Pivot function allows positioning on small boards without interference of the nozzle heating throughout the rework processes. • Non-contact temperature sensor monitors topside board temp and triggers localized reflow process once the target temperature is reached. • Rework capacity and process control for small boards can be substantially increased by the addition of the four-zone, high throughput carousel fixture. 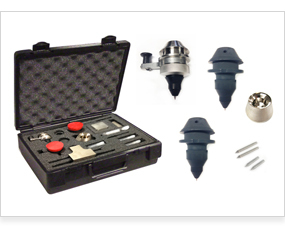 ﻿• Includes Standard and Micro nozzles. • High temperature composite vacuum tip eliminates metal-to-metal contact. • Vacuum sensor automatically and continuously adjusts tip height, providing non-contact site cleaning. • Various size heating noses and tips to clean virtually any site. 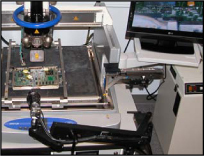 • Ready-to-use site cleaning programs for fully automated solder removal. 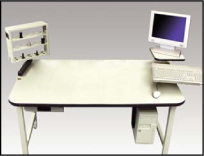 ﻿• Provides a safe, repeatable location for component pick up, flux dipping and drop off away from the heated work area. • Eliminates manual component loading/removal in the heated work area. • Software-controlled pneumatic shuttle enters the work area for pick up, flux dipping or drop off, then exits the work area. • Shuttle-based component pick up and flux dipping is set and monitored with machine force placement system. 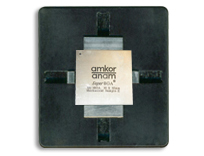 • Multi-location pick and flux dipping capability for multi-processing of small devices (custom tooling required). ﻿• Provides high magnification site viewing including the ability to verify when component reflow has occurred. • Operator is instructed to position the camera on the site. Focus, zoom, and lighting adjustments are made to optimize clarity. The image is displayed on a flat screen monitor. • A process development aid especially for difficult to see tiny solder joints. • Recommended for use in conjunction with the automatic site cleaning system to verify cleaning on dense assemblies and for the dispensing option to provide dispense inspection capability. • Workstaton provides a self contained work cell environment for the machine and operator. Dimensions are 60"W X 36"D. Very sturdy construction with anti-static laminate surface. (Workstation includes CPU holder, everything else is an add on option). ﻿• Mechanically self-centers any device for accurate pick-up. Used in conjunction with the automatic component shuttle. • ﻿Provides increased top side clearance for assemblies with vertical daughter cards or tall devices that exceed the standard 30mm (1.2”) top side clearance. ﻿• Removes flux vapors for operator health and safety. • Includes fume extraction manifold and hose assembly. • Requires connection to a central exhaust or self-contained filtering system.